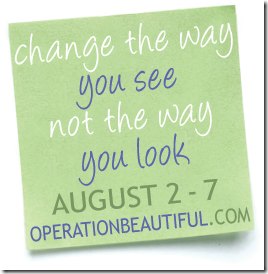 Change the Way You See: Join the Operation Beautiful Movement! Operation Beautiful hits store shelves this week! I am so excited to get my copy in the mail, as Operation Beautiful is a cause I stand 110% behind. “The real voyage of discovery consists not in seeking new landscapes but in having new eyes.”– Marcel Proust. It’s one of my favorite quotes that in many ways addresses the art of “reframing,” something that truly helped me recover from my disordered eating past, as I learned to look at my situation through a different lens. This notion is very much what Caitlin, the leader of the Operation Beautiful movement and blogger at Healthy Tipping Point, is promoting. So I thought today, in honor of this special week, I’d explore this notion a bit further from the lens of my current state in the hopes that it will inspire some conversation here on the blog, or maybe it’s something you’ll explore or ponder in your own private life. Either way, in our society that glamorizes thinness above all else … it’s a conversation that needs to be had. So here is my take. Being pregnant, it’s not surprising that my sense of physical sense has completely changed. Obviously, I’m in a position where my appearance is changing; where gaining weight is required and comes with the territory. But instead of fearing it or freaking out about it, I’m seeing myself through a very different lens than I did previously. I’m viewing my body as more than just a body but rather as a source of life — one that isn’t mine and mine alone anymore. I can’t (and wouldn’t) abuse it and risk jeopardizing her health for anything. Now I realize this is a unique experience in changing how you see yourself, as I’m literally undergoing a physical transformation as we speak. But I feel like it’s teaching me so much already, and hopefully I’ll continue to see myself in this better, more positive light even after our little girl is born. If anything, I want to be able to set a good example for her someday: teach her that in spite of what she sees around her in the media or at school or wherever … she’s so much more than just her looks. And that’s a lesson that bears repeating until our society as a whole changes what it values. Operation Beautiful is a great first step and one I am happy to support. Will you join the movement? How about you? How can you change the way you see? Next postWhat Does “Too Thin For Her” Even MEAN?! Those are some very powerful words. I felt the same when I was pregnant with my son. I wanted to do everything right so he would have every opportunity. It wasn’t easy but I did it. I now I have a beautiful 4-year-old. I wish you a beautiful and wonderful pregnancy. Congrats! Ahhh! I love the “vessel” philosophy. I wish I had heard you say that on my 3rd & 4th pregnancies! hey lissa! you are having a girl!? is this recent news or did i miss a post? thanks for this post. i really need this perspective, as im getting into a bad rut of body hate and negative coping patterns. thanks for the encouragement and inspiration. i may not be pregnant, but i am also a vessel of God. It’s old news–in my initial pregnancy post — we have known since 11 or 12 weeks, when we had all the hellacious genetic testing done. Love yourself!! 🙂 You are, indeed! I’m pregnant with my second child and it really is amazing how pregnancy can change your outlook on things. I know before my first pregnancy I had many self image issues. I battled binging and felt so uncomfortable with my body. Seeing that my body could carry life changed so much. Congrats on the girl! They are wonderful. And so important to have a positive mindset to share with them as they grow. "Do Your Best, Forget the Rest"
Open Letter to the Blogosphere: Blogger "Responsibility"